Stephen Nichols has been involved in Australian football in the north east of Tasmania for more than 50 consecutive seasons, only missing playing in 1981 and 1985 due to serious knee injuries. He began playing as an 8-year-old junior at Bridport in 1960 and has been a champion at Scottsdale and for Tasmania at senior and masters level. During the Scottsdale Magpies’ dominant era of the early and mid-1970s Stephen Nichols was considered one of their very best players amongst a team of predominately local champions. With his prominent blonde hair, Nichols was easily recognised as he caused havoc across half forward for Scottsdale across Tasmania and at national level. Nichols had a tremendous goal sense and was extremely hard at the contest, but unscrupulously fair, which saw him recognised by the umpires, media and his playing and coaching peers. 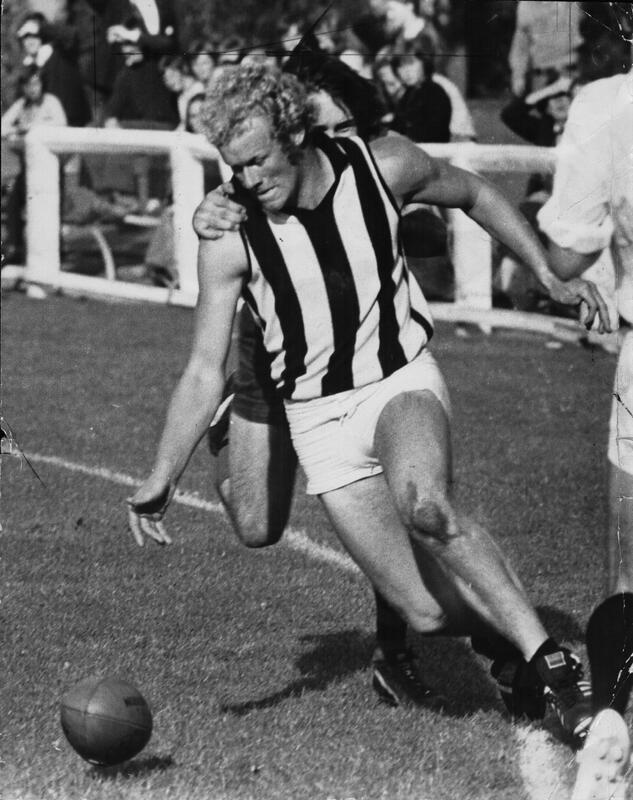 The Scottsdale Magpies enjoyed a period of unparalleled success from the early 1960s to the early 1990s and Stephen Nichols contributed to eight premierships and a further three grand finals during his 20 year senior career. Incredibly, after winning the Northern Tasmanian Football League (NTFL) reserves best and fairest in 1988, he was again elevated to the Scottsdale seniors in 1989 and helped the club take out its only NTFL title as his swan song at senior level. Stephen Nichols continues to contribute to football in north east Tasmania and played in a premiership with his original club, Bridport, in 1993 and has undertaken stints coaching the under 19s (six seasons) and reserves (four seasons) at Scottsdale and also with the Scottsdale Crows and Branxholm, where he pulled on the boots for a few senior games while coaching the Canaries in 2008. Not surprisingly the Scottsdale legend’s endurance and love of the game has also seen him participate and coach in masters programs. His ability ensured his recognition as an All Australian Masters footballer in the mid-1990s.